A shrub or bush is a horticultural rather than strictly botanical category of woody plant, distinguished from a tree by its multiple stems branching from the base, none of which are dominant, and by a lower height, usually less than six meters (20 feet) high at maturity. Trees are considered to be the largest plants and are usually defined as a large, perennial (living more than one or two years), woody plant at least six meters high at maturity and, more importantly, having secondary branches supported on a single, woody main stem or trunk. Neither shrub nor tree is a single taxon (unit of biological classification) but each include members of many plant taxa. 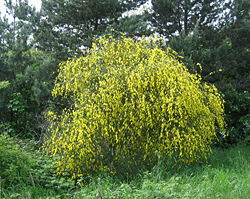 Examples of shrubs include the lilac, forsythia, and azalea. Shrub is an imprecisely defined term. There are some "trees" that have two or more trunks, and the cornelian cherry (Cornus mas) generally is described as a shrub although it grows to 25 feet tall (Tenebaum 1997). Likewise, the Sargent crab apple (Malus sargentii) may only reach 12 feet, but is generally considered a tree (Tenebaum 1997). A plant may be described as a shrub or tree based on how it is used in landscaping and if the lower branches are removed (Tenebaum 1997). Shrubs are used in landscaping for their aesthetic appeal to human beings, appealing to people's inner search for beauty through their colors, fragrances, patterns, and so forth. Some may be used as hedges or screens, and some offer green color in northern winters. Shrubs are important components of the natural landscape, providing habitat and food for animals, and protection against erosion. In some environments (high elevations, arid or arctic climates), there may be few or no trees, and shrubs provide forage and cover. Generally, a shrub is considered a woody plant that has several stems and is smaller than a tree. However, a large number of plants can be either shrubs or trees, depending on the growing conditions they experience. Small, low shrubs such as lavender, periwinkle and thyme are often termed subshrubs. A natural plant community dominated by shrubs is called a shrubland. The word bush can also refer to a type of plant community, as in the Australian bush. This is often characterized by scrubby, open woodland and is a generic term for Eucalyptus dominated woodland in particular. An area of cultivated shrubs in a park or garden is known as a shrubbery. When clipped as topiary, shrubs generally have dense foliage and many small leafy branches growing close together. Many shrubs respond well to renewal pruning, in which hard cutting back to a "stool" results in long new stems known as "canes." Other shrubs respond better to selective pruning to reveal their structure and character. Shrubs in common garden practice are generally broad-leaved plants, though some smaller conifers, such as Mountain Pine and Common Juniper, are also shrubby in structure. Shrubs can be either deciduous or evergreen. Hessayon, D. G. 1983. The Tree & Shrub Expert. Waltham Cross, Herts, England: PBI Publications. ISBN 0903505177. Mason, S. G. 2002. Landscape Trees and Shrubs. Minnetonka, Minn: Creative Pub. International. ISBN 1589230027. Tenenbaum, F. 1997. Taylor's Dictionary for Gardeners: The Definitive Guide to the Language of Horticulture. Boston, Mass: Houghton Mifflin Co. ISBN 0395876060. Selecting Shrubs for Your Home (University of Illinois Extension). This page was last modified on 15 September 2015, at 17:04.